Ad occhio, Italian for “by eye”. It’s a very natural way to cook, measuring by eye and cooking not by the clock but by the way something looks (or smells or feels). It’s the way I first learned to cook – standing on a stool so I could look over my grandmother’s electric stove top, learning to scramble eggs. Or making pancakes dotted with banana slices or fried rice with eggs (still my go-to comfort food) with my mother. These are the things that I can remember cooking the most as a child, and things that you also don’t need recipes for – you simply need to look, feel and you just know when it’s “right”. This is what home cooking is. 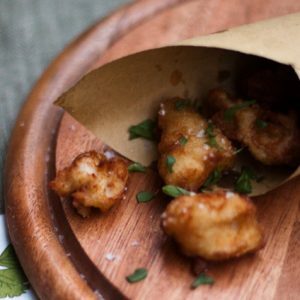 I was inspired recently by my friend Sarah Fioroni at her suggestion to teach a cooking class all ‘ad occhio‘ – after all, traditional Italian cooking is done this way. A handful of flour, “enough” water to bring it together to a soft dough to roll into long, thick, uneven noodles for pici. How much is enough? As much as the flour can take – this is the concept behind quanto basta, abbreviated to q.b. – something you will often find in Italian cookbooks. You’ll know by the feel of it. Then a sticky dough for schiacciata, layered, by eye, with torn figs, a scattering of raw sugar, then drizzled with olive oil, q.b. Baked for how long? Until it is golden on top, crisp round the edges and the figs oozy. Just take a look at it and you’ll know. After having just turned in the manuscript for my third cookbook, I am a bit ‘reciped-out” and although I do like being precise and having all the information possible for those who need it (and that’s what the editors like! ), I also like letting loose and just cooking – no books, no recipes, no measuring equipment. I like using all of my senses — every single one — when cooking: watching, listening (you can hear when something is sizzling too fast, the water has reduced too much, or something isn’t simmering fast enough), inhaling all the smells that tell you that the schiacciata is ready or that there’s enough or not enough garlic in the sauce (Marco with his super sommelier smelling powers can even tell you when he can smell there’s not enough salt in the sauce), touching the dough to make sure it feels as soft as a six week old baby’s bottom and tasting – well, that one goes without saying. To me, these are how cookbooks should be, describing the sensory clues, what you should smell, what something should feel like or look like, how it should taste – because that is how you learn to cook intuitively and, let’s face it, not everyone is measuring their ingredients the same way, the source of heat and type of pot or pan can change the cooking time and its effects. Really, the numbers shouldn’t be the focus, but a guideline, a suggestion. 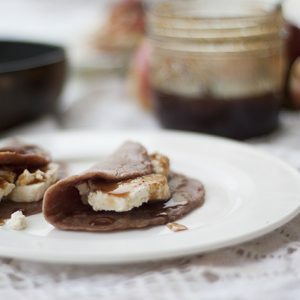 Following this idea in my cooking class recently was freeing, I felt like a child again (and it wasn’t just the rolling out of snakes or playing with sticky dough), standing on a stool and cooking ad occhio, reminding me after months of careful measuring and recipe testing of how joyful it is to just freely cook. 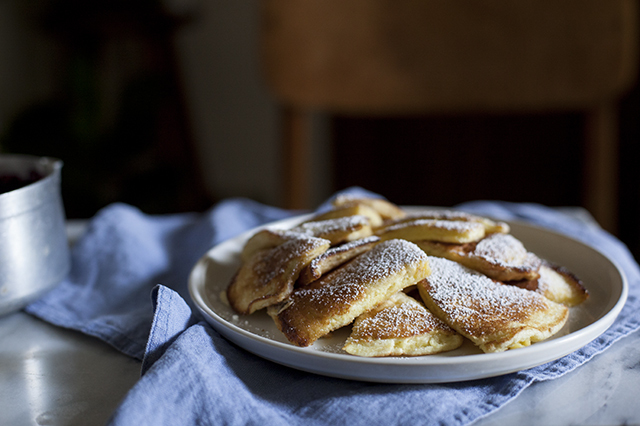 A couple months ago I had come across a recipe for these frittelle spezzettate, or Kaiserschmarren, fluffy, ‘broken up’ or shredded pancakes from Alto Adige in Italy’s far north (and Austria, which the region borders), and thought they’d be just the thing to go with an impulse buy from the market – tiny, sour wild blueberries from the Tuscan mountains. The whites are whipped separately, adding natural fluffiness and that plenty of butter is used to crisp the edges and add flavour. Some like to add raisins soaked in water (or rum). 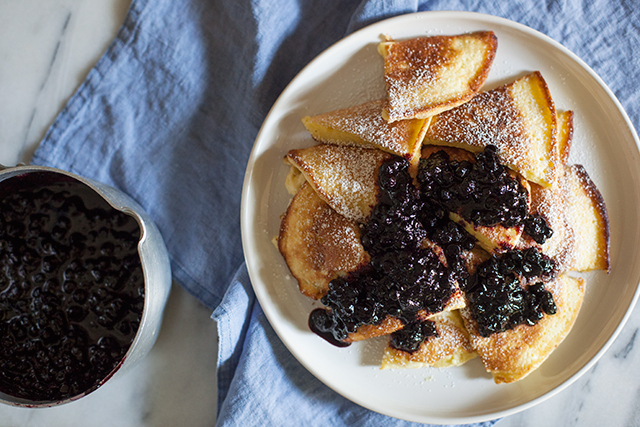 Otherwise they are made with a simple pancake batter, split up (or cut up) while in the pan, then served hot with wild berry jam — in my case, the wild blueberries, quickly cooked with a few spoonfuls of sugar. To make two to four (this depends on how hungry you are) serves, use three eggs, separated. 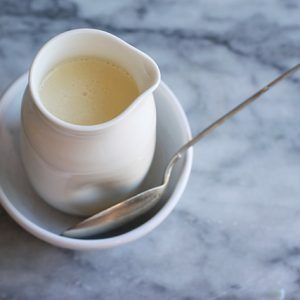 Pop the yolks in a bowl along with a couple of handfuls of flour and enough milk to bring everything together to a smooth – but not too liquid – batter. The whites go in another bowl, along with a couple of tablespoons of sugar. 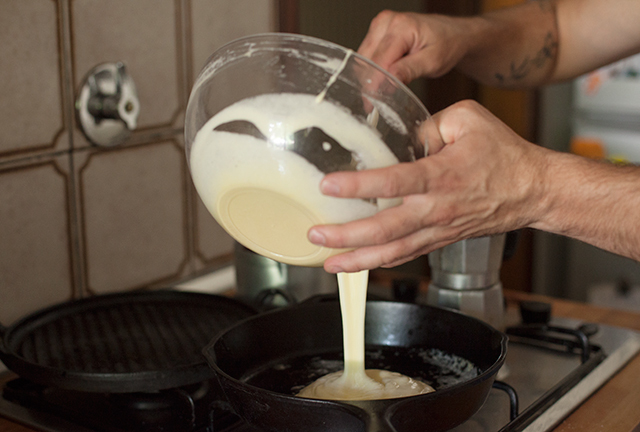 Whip to soft peaks, then fold into the rest of the batter. If you are using the rum-soaked raisins, add them. 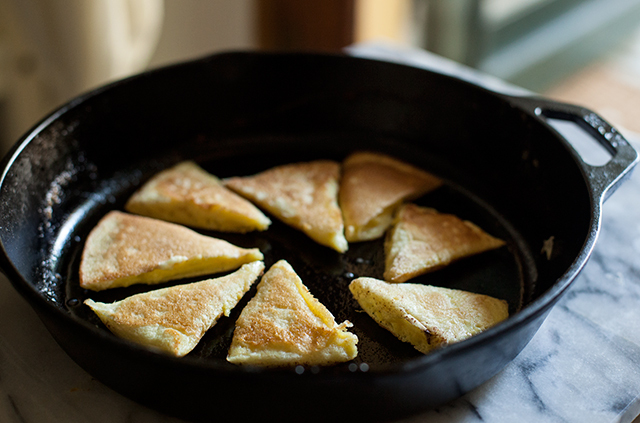 Heat a knob of butter in a skillet and when melted, add a third of the batter to make a round, medium-sized pancake. When you begin to see a few bubbles appear on the surface, take a peek underneath. It should be a satisfying golden brown. Cut the pancake into four with your spatula then flip the four pieces and break these up further with your spatula into eight pieces. Add a little more butter if you like (I do). 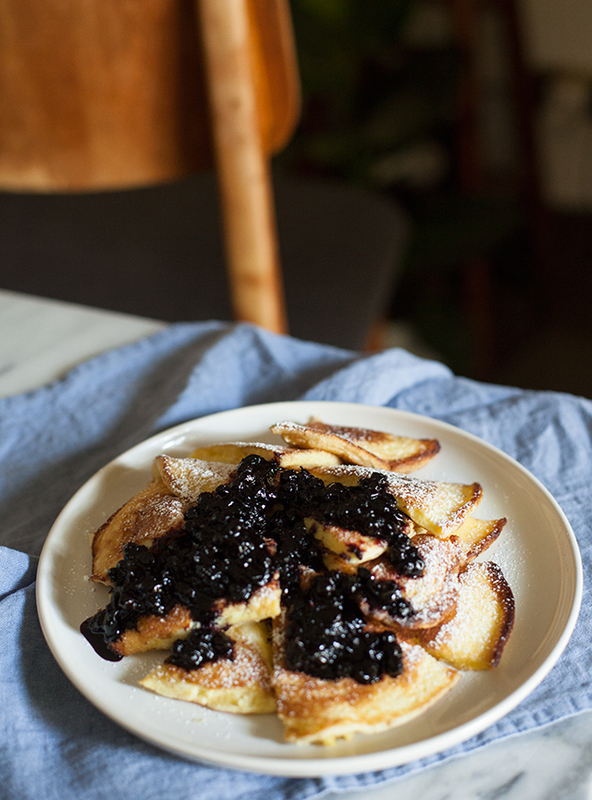 Transfer to a plate and serve immediately with a dusting of icing sugar and berry jam or sauce, and continue with the rest to make two more pancakes. 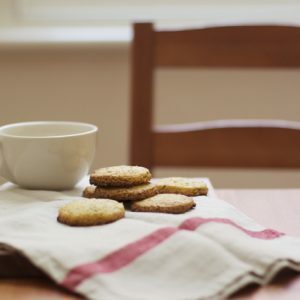 The cook gets to eat the last batch – these are best eaten warm. I love this ‘non-recipe’ ! You’re right, cooking by instinct is the most satisfying and I can never remember if its 1-¼ tbspns or 1-¼ tspns in a recipe but if you tell me what it should look, smell, taste or feel like, that I’ll remember ! I love this way of cooking – it’s the way I cook most of the time, something my accountant daughter finds difficult to understand. I especially love going to my vegetable garden to see what’s available, and using it in whatever way takes my fancy. Today – pesto inspiration, but made with carrot tops, not basil. Loved the article and the way of cooking too. Thanks for the suggestion, I’ll be redesigning my website soon and will find out if a print button can be added! Thanks for reading.